Twenty years ago we purchased our home right smack in the middle of suburban Long Island for $273,000; before real estate prices went through the roof (pardon the pun)! We were due for some good luck after losing money on our former home in New Jersey, aka the White Elephant. Our good fortune extended these past 20 years with very little damage, a few leaks, and a boiler that needed replacing. Anything broken, old, or in need of repair was updated. Roof, windows and floors replaced, kitchen and all three bathrooms renovated, pool and hot tub installed. The only two things left by the previous owners are the washer and dryer in the laundry room. For some reason the resilient pair keep chugging along! Our home is our biggest asset and we’ve put tremendous effort, care, and financial investment into its upgrades. Many of us take better care of our homes than our emotional investments. Wouldn’t you agree a marriage should receive at least the same care? We’re all guilty of falling into bad habits: nagging and complaining, but “leaks” can be repaired, with a little help from good professionals, or in our case, a 3,000 year old science. I was 55 when my marriage broke after years of leaks, compounded by too many family funerals. When a baguette in my engagement ring went missing, as did my husband, I began to lose my grip much like the prongs holding the ring’s one-carat diamond. I took the jeweler’s appraisal as a sign something was terribly wrong. I knew something was wrong like how I knew the drain was clogged but refused to do anything till it got so bad I finally needed to call the plumber. 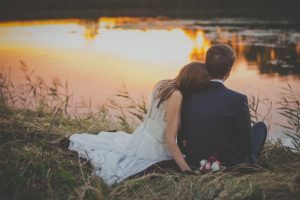 So why is it so many people give up when something breaks in the marriage? What about fixing it? Is it customary to get a few estimates on how long it takes to fix the marriage? I was in denial about being emotionally abused for eight years. I did call a few “plumbers,” but no one was willing or able to fix the problem. I hoped the marriage would magically clear itself and start working again! My marriage was a 24-year investment in desperate need of renovation! I vowed to marry for the long haul and after moving six times in 10 years, I had no plans of relocating. I think some people don’t realize that G-d willing, life is long, and we are strong enough to endure terrible times. How long is the long haul? Parenting takes a toll on your marriage. It’s the hardest when you have children. It’s not a good idea to make crucial decisions in the midst of raising a family when things are usually far from perfect. When things got really bad I didn’t want to run away. I knew my husband was hurting, so I dove in and helped the man I knew he truly was emerge out of the nightmare. I sacrificed my pride without any idea of what would happen next. Little did I know the pride I forced myself to bury, would be replaced with an entirely new and improved pride wrought by forgiveness and personal strength. Many people cut and run only to realize they were too hasty in their decisions to end their marriage. “If I had known I’d have to work to support myself for the rest of my life, I wouldn’t have pushed so hard to get divorced,” my cousin told me. I felt so sorry, remembering she was young when she divorced. Horrible things happen to people who don’t deserve it and don’t have the luxury of expunging circumstances from their lives. I could have just “dumped” my “rotten” spouse. The other alternative was to finally get to know him; what made him tick, why he started rotting, and what I could do. At this point in the long haul he needed my strength! 1. Talk Therapist — PROS — A professional hears your story and helps you figure yourself out! Good to have a mediator so you and your partner are not screaming at each other. CONS — My husband felt I was attacking him and only focusing on what he was doing wrong. He sat there while I spewed out my complaints and fears. 2. Writing Coach — PROS — I realized so much about myself by writing my life story. I was able to see my patterns and habits and begin to understand myself. CONS — You just might want to write a book and never see your friends or the light of day. Your dog gets neglected too. 3. Kundalini Yoga Teacher — PROS — Rewiring of nervous system, endocrine system; breathing, meditation, and movement will help calm anxiety and make habit changes organic. Gives you a practice to support the changes you want to make as a team. Eyes are closed and only the teacher watches you. CONS — You have to make the time to go to the classes. 4. Cardio/Aerobics Teacher or Class — PROS — Doing some kind of physical exercise releases happy endorphins and keeps you positive. You will look and feel better. CONS — You have to make time to go to the classes. There was nothing more important than my marriage and my family. I had been around enough divorce for six lifetimes and I couldn’t put my son or me through that ordeal! I needed to find a solution! I was in dire need of renovation. The practice of Kundalini Yoga helped me change habits and patterns with ease and speed! There’s no nagging, complaining or belittling in Kundalini Yoga. You just go to the classes, experience the benefits, and everything starts getting better. There’s no pressure, no religion and they are the most laid back people you’ll ever meet. When I take a break from the practice of Kundalini I feel my energy ping-ponging around the room. I think back on how my nervous anxiety affected my family and I reject it immediately! I want to tell people not to be hasty, realize that hopefully it’s going to be a long, life together, and when you renovate your own “rooms” it can be messy and uncomfortable in the beginning, but you enjoy the upgrades for a long time! It’s been three and a half years of Part 3 our marriage — where we really, truly know each other, the good, bad and ugly. It’s looking like our marriage might even be strong enough to outlast our resilient washer and dryer!